Although many of you gardeners have been showing off your dahlia flowers for months now, I’m really excited to see the first flower in my backyard. This was a real learning experience for me, nursing the bulbs, learning how to prune, feed, etc. Now it’s all worth it, and there are going to be so many of these babies popping soon. 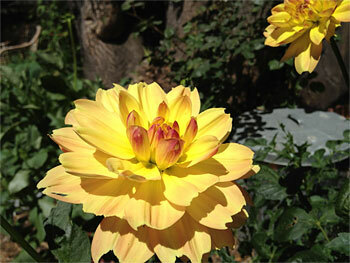 Dahlias have always been one of my favorite flowers, but I’ve never grown them on my own. This year I got ambitious, and sent away for a bunch of bulbs. This variety is called “Bracken Lorelei.” So pretty! I got them from a place in Monterey, Elkhorn Gardens. I thought that since they were in a coastal california area, bulbs from their flowers would do well here. 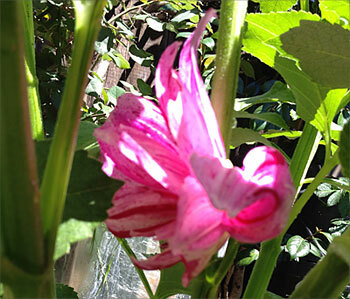 They mostly are, although some varieties have been sprouting much more slowly than others. That’s just fine with me, as I am trying to find places to put them as they outgrow their pots! I learned a lot of lessons my first time out: keeping the bulbs warm at the beginning, pinching back the center stem early on so they bush out, and others that I can’t remember. 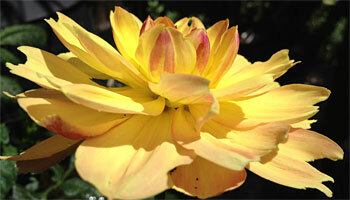 I talked to a woman in the dahlia garden who gave me a hands-on display of disbudding that was really helpful. Many thanks go to my friend LeeAnn, an amazing Mendocino County gardener, who was very patient with my questions, when I got the bulbs in the mail and flailed a little, so good to have a friend to call when I got overwhelmed by all the dahlia info on the internet. My biggest challenge right now are leafhoppers, every year I notice them in my garden, and they REALLY like the dahlia plants. It’s amazing how much damage just one can do, and I have many. I just got some green lacewing larvae, released them on Sunday, so we’ll see if they start to turn the balance. Prior to that I was spraying a soap mixture by hand, or even just misting the plants early on to discourage them, but that’s too much work for a lazy person like me. Here’s one more variety that’s hiding out, the first flower came out in the middle of the plant, but there are many more buds that are ready to blossom. I can’t WAIT! Yep, as my friend told me, I don’t let any petals touch the ground!